Multi-channel, flexible and scalable activation campaign to increase cycling. How can we encourage more people to cycle everyday? Beyond the infrastructural and cultural improvements we can also accelerate adoption through connecting to people’s personal needs, educating them to the far reaching benefits of cycling and outline the facilities around them. We created Go Cycling as a highly visual and scalable campaign brand that can stimulate cycling with targeted audiences. 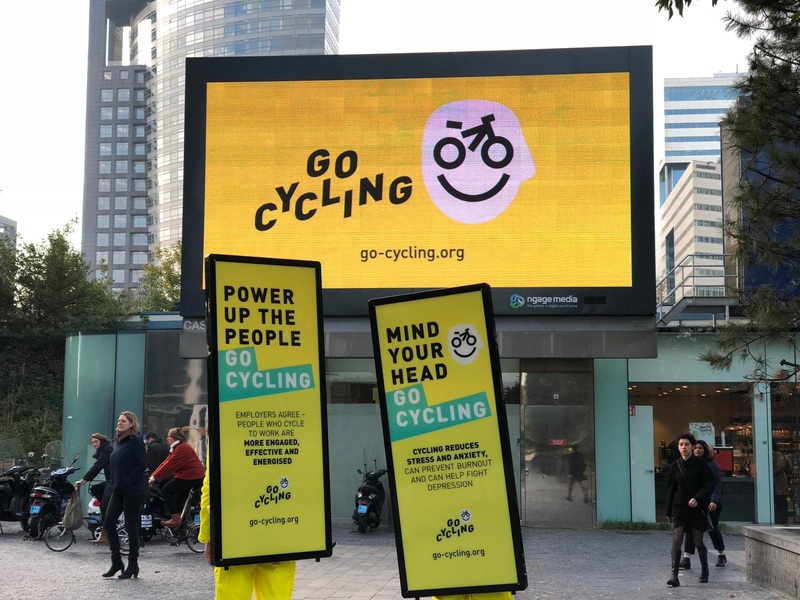 Go Cycling was run for an initial one week across World Mental Health Day (10 October), working with our partners in Amsterdam’s international business district, Zuidas. 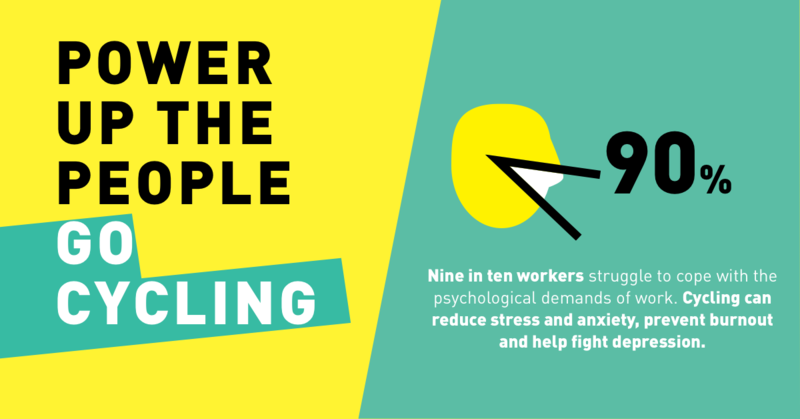 We chose to focus the first activation around how cycling can improve mental health amongst employees because one in four people suffer from mental health issues, and many more suffer from work-related stress every day. Increased cycling has been proven to dramatically improve wellbeing, as well reduce stress, cut the risk of developing serious mental health issues and even reverse some of their effects. We created a visual brand, and created strong campaign messaging, brought to life on a website, walking billboards, flyers and outdoor advertising boards. Campaign messaging balanced outlining the positive benefits, as well as detailing the support employers and employees receive to get cycling (including grants, tax incentives, facilities). The messages were also shared through workplaces with company newsletters and local media activations. We kicked off the week with a number of experience opportunities, bringing bikes into office buildings to offer testing. And we toured a giant pledge wall where business leaders and everyday worker were encouraged make a commitment to cycle more and given tips on how to get started. This was further brought to a life with a special free public event from our SHIFT series, that brought together international experts on cycling and mental health to discuss the campaign issues. Thousands of people were exposed to the campaign messaging through the week, with 38% of those surveyed saying it had inspired them to cycle more. Further data outlined that 36% people would cycle more if their employers provided greater incentives, giving us strong ammunition to work further with businesses to improve communication, facilities and support for people to cycle to work, including through the BYCS’ Bike to Work offer. The pilot proved the success and huge future potential of the Go Cycling campaign format. 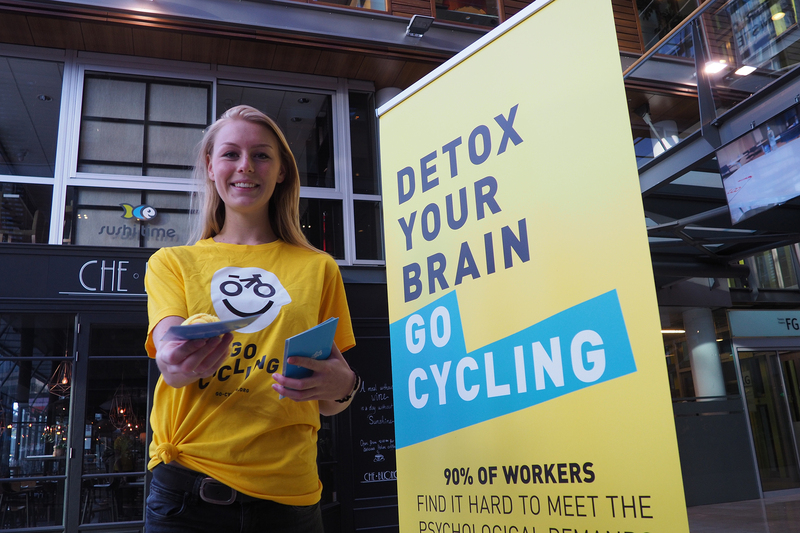 We are looking for new partners to work with us to expand Go Cycling to tackle new topics (covering anything from environmental impact to childhood health) or to run the mental health campaign in their local area. Speak to us today about how to bring Go Cycling to life with us.